This wonderful post was submitted by a “Raining Hot Writer”. Thanks, Bobbie….I love all these unique ways to help Children learn about money! We strive to be wise with our money and practice it in many ways. However, sometimes we fall short in helping our children learn the wisdom of our ways. Yes, they learn by example, but there are also practical ways to teach them. Here are just a few examples that you may want to implement into your own lives. 1. Instead of giving them a general set allowance each week, create a set amount of money for each chore that they complete in the week. You decide what their minimum chores would be for the week and also what their minimum allowance would be as well. You also decide what their maximum chores would add up to as well. This teaches children the pride of earning their cash per chore rather than earning a set amount no matter how little or much they do in the week. 2. When they have a birthday or receive money of any kind you can teach them the importance of savings by allowing a certain percentage to always go to their savings account at the bank, no questions asked. If you are trying to teach them the importance of 10% tithing , you could in addition, set aside that amount to drop into the offering plate on Sunday. Show them the balance of their savings account each time to get them excited to see their money growing. Give them goals on what they would like to purchase with their savings. 3. Instead of giving material gifts, how about the gift of a savings bond? Children may not appreciate this in their younger years, but when they are older, they will thank you ten-fold and teach them the valuable lesson of patience with watching money grow. You could even ask your children if they would like to buy a savings bond from the money they have in their savings account. The possibilities are endless. 4. When going to an big event such as the Circus, be specific with your children on the amounts you would like to spend and stick to that. This teaches them the value of items as well as teaches them not to spend on demand and foolishly. Teach them good habits and a healthy awareness. And who knows your children may be stock-brokers by the time they reach age 3… wishful thinking I know. Hurry and request a FREE Thit! T-shirt! All you have to do to get this great freebie is fill out this mailing form and use promo code 5qklvr. It’s that simple! *HOT* Make a $0.50 Purchase at McDonald’s = a FREE $10 Amazon Gift Card! This expires today 9/8 so be sure to make your purchase today!! I just wanted to clarify for all of you how GOOD of a deal this truly is… You can make ANY purchase at McDonald’s…including off their $0.99 menu or even their $0.50 ice cream cone they offer for the kiddos! That means you will spend $0.50 – $0.99 and get a FREE $10 gift card to many different places of your choice including Amazon!! Wow! 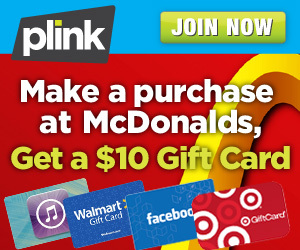 Right now new Plink members can score a FREE $10 gift card to Amazon, Target, Walmart etc When they make ANY McDonald’s Purchase! That’s basically like a FREE $10 in items. Plink Member must link a credit or debit card and make a purchase at McDonald’s by 9/8. Our topic today is going to be on “Budget Vacationing”! I am excited to get others peoples advice and tips on the best ways to save money while planning a vacation as well as how to save money WHILE on vacation! I haven’t been on a ton of vacations but I did plan my Hawaii trip and Disneyland trip and the number one piece of advice I have is to put the package together yourself instead of at a travel agency! I tried with both of these trips to use a place that plans trips for you and both times I came out a lot less expensive in the end…..actually MUCH cheaper! UPDATE: Another AWESOME idea is to get gift certificates from Restaurant.com for the area you are traveling to. I usually post 80% off codes so when I do, you may want to stock up! For the Hawaii trip, I used Cheaptickets.com. *I search for Flight, hotel, and rental car packages all in one. Between the different companies (Expedia, Bookit, Orbitz, etc) Cheaptickets was by far the best in price at the time BUT I do recommend checking all of them because sometimes others are cheaper! *ALSO, I bet you may not have known this, but you can go through ShopAtHome to get up to 4.2% cash back and more or less for other companies! That can be a lot for a trip! *When you are in Hawaii (or wherever you may be going) make sure and get a small fridge in the room. Then, stop by the grocery store there and pick up cold cuts, bread, drinks, snacks, etc! MUCH cheaper than eating out every time you get hungry. Hey, you can even bring your coupons and use them!! 😉 That would be a true “coupon pro”. For the Disneyland trip….I planned this all myself. *I actually got my tickets on Ebay. You can also check Craigslist.org and search “Disneyland tickets” under your city or under Anaheim (where Disneyland is). You pick up the tickets from a place nearby. *As for the Hotel, we stayed at Park Vue Inn (pictured below). I really liked this hotel because although it is not super fancy, it was clean, they have a nice continental breakfast, it is a great price for hotels in that area and guess what….it is literally DIRECTLY ACROSS the street from the entrance to Disneyland! There is also a Denny’s next door (obviously all within walking distance). *Last little piece of advice is to get the “light swords” (that the kids just LOVE to have at night) right in front the hotel (or in front of the entrance to Disneyland). They are SO much cheaper and you can get 3 times the lights for the price. So….I hope that helps some and trust me, as a girl who LOVES to save money, I researched the heck out of these trips to get the best deals and those were my experiences. Now, it’s your turn…what are YOUR tips for saving money planning a vacation?! WooHoo! I am so excited to announce that I have written a “Learn How to Use Coupons” Ebook!! I decided to offer this for FREE because I know we are all trying to save money here and want you to trust that I am here to help you. I too had to learn how to use coupons and save money and with years of experience, trial and error, I felt it was time to pass my knowledge on to others. You will just need to sign up for my free daily deal email BELOW (you must verify the email they send to confirm) which means you are going to get 1 email every day that has all the freebies and deals I’ve posted in the last 24 hours so you never miss a hot deal! After you sign up for the email and CONFIRM your email address, you will automatically be taken to the page to get your FREE ebook! *HOT* Free Head and Shoulders at Dollar General! Heck yeah! If you’ve got a Dollar General nearby, you are going to want to head on over there as soon as you can because this week, you can pick up FREE Head and Shoulders! Wow! Hurry over to print out this HOT new coupon for $2.00 off any REACH Brand 2 Pack which will make for some FREE Toothbrushes at Walgreens starting tomorrow (6/16)! Print your coupon now as it may not last long…You will actually be making $1.00 after the RR! = FREE + make $1.00!